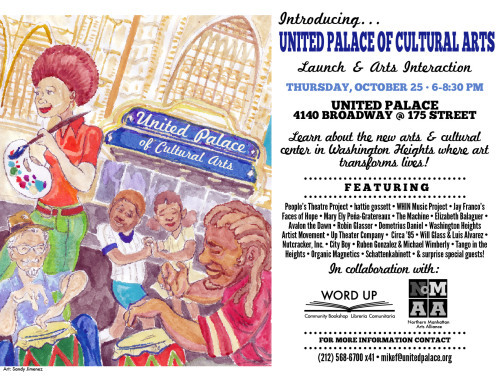 Next Thursday, October 25, from 6 to 8:30pm, please join Word Up as they help their friends at the United Palace launch a new organization, the United Palace of Cultural Arts. If you have never been to the Palace, that is reason enough to make the trip: taking up the whole block between 175 and 176 streets, and between Broadway and Wadsworth Ave., the Palace has been remarkably well-maintained since opening its doors as the last of the Loew’s Wonder Theaters in 1930, and its interior is real eye candy. The great thing is that, beyond the awesome acoustics and sight lines of the main theater, there are dozens of corners and crevices throughout the space as a whole that are ripe for presentation. Strange little zones that would be “just the back door area” in any other theater are, when evaluated in their own right, actually beautiful spaces where art can be made and shared. So the fun part of next Thursday night is that we are going to make use of as many spaces around the place as we can. If you come at 6pm sharp, you can catch the official introduction to the United Palace of Cultural Arts in the main theater. Then at 6:30, the whole of the Palace will begin to ring with sound and movement. We will have a mini Word Up book stall in the grand foyer—bring your wooden coins if you have them! Phew! You’d think that was it, but we also have surprise special guests that have us so excited that we have to sign off of this post and go watch their video now.See you on Thursday, October 25! 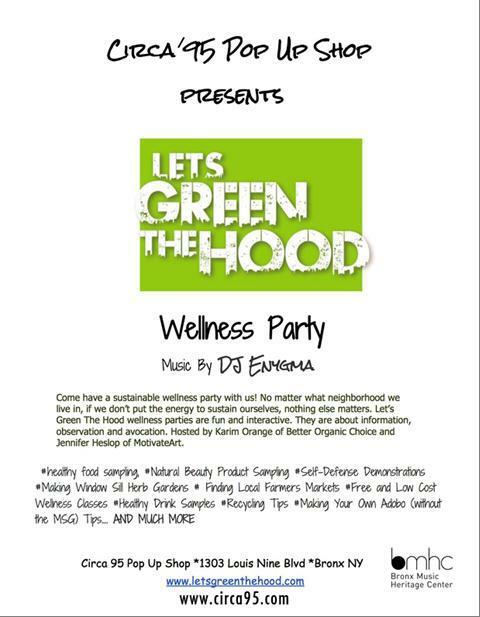 CULTURE ::: The Uptown Wellness Series @Circa95 Pop-Up Shop ::: June 30th ::: FREE !!! MONDAY - WRU @ Coogan's 4015 Broadway (btw 168th & 169th) // Every Monday (Rain, Snow or Shine) // Bag Check // Meet @ 7:15pm - RUN @ 7:30pm Sharp // All Paces Welcomed. SATURDAY - C95 Run - Meet up at different locations. Curated routes featuring music, art and culture. Ending with great food & vibes. Meet @ 12pm - RUN 12:15pm Sharp. // All Paces Welcomed - Check Instagram weekly for updates!